It's time to jazz things up with some brighter colors, inspired by the runways. 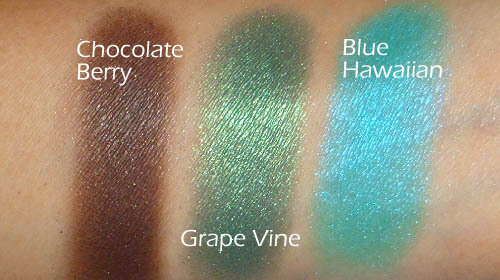 I'm doing a tropical-paradise color scheme, with lush emerald green, rich brown, and a glowing turquoise. You will also need a brown pencil for definition and an aqua/turquoise (optional) colored pencil to echo the blue on the waterline. I used Coastal Scents Hot Pots on the lids and Bourjois pencils, but do use any alternatives you have. 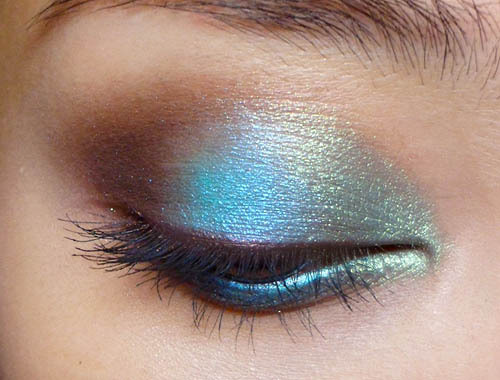 You can do a look with similar colors; they don't need to be identical. Step 1: Instead of following the color-wheel (blue, green, brown), I wanted a little extra contrast by putting the brightest color in the center of the lid, where it will pop against the dark brown. Apply along the inner 1/3 of the lower lash line as well. 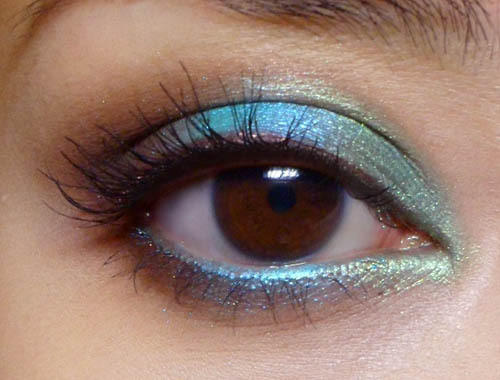 Step 2: Pick up the bright aqua or blue and pack it down the center of the lid. Don't blend it out too much as you want the color to be quite intense. Apply the same along the center portion of the lower lash line. Step 3: Pack the dark brown into the outer 1/3 of the lids, and then gently run it inwards along the socket line, until you reach about the center of the lids, above the bright aqua. As before, run the dark brown along the outer 1/3 of your lower lash lines to finish. Step 4: Here's the fun part. 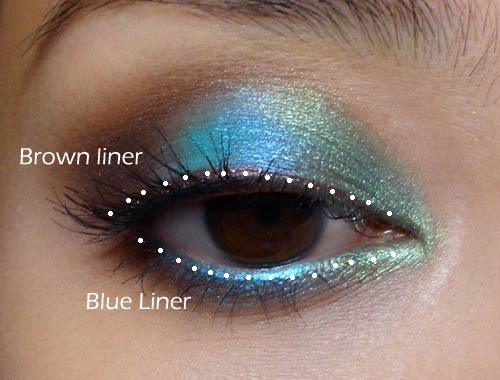 Run a brown pencil along the upper lash line for definition and some extra contrast against the aqua blue. On the lower lash line, I actually used a bright turquoise blue pencil (Bourjois 54 Bleu Clinquant) to match and intensify it. perfect to hang on any wall in your game room, sports room, or office.